Guests on Royal Princess were welcomed with great fanfare by the iconic USC Marching Band and a fireworks display to celebrate the start of her West Coast season. Royal Princess is Princess Cruises’ largest and newest ship based on the West Coast, sailing guests to the Mexican Riveria, the California Coast and Alaska. A Royal Princess arrived at the Port of Los Angeles on Saturday – that is, the 3,560-guest Princess Cruises ship – now here to take travelers to sought-after destinations including the Mexican Riviera, the California Coast and Alaska. 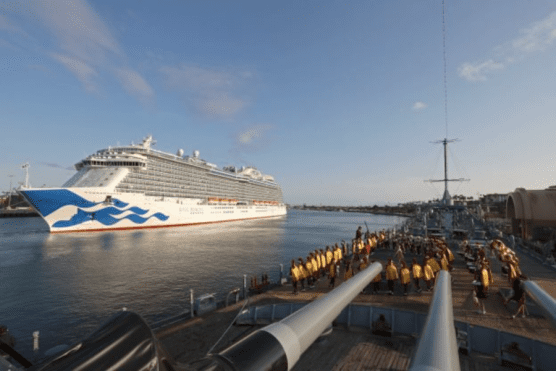 In celebration of Royal Princess’ maiden call to the Port of Los Angeles and the cruise line’s biggest West Coast cruise season, a “Royal” fanfare marked the occasion highlighting the arrival of one of Princess Cruises’ newest and most elegant ships. To mark the ship’s maiden call and celebrate her West Coast season, the iconic University of Southern California Trojan Marching Band, under the direction of Dr. Arthur C. Bartner, provided pageantry and fanfare for guests sailing on Royal Princess from a grand location onboard Battleship IOWA. As Royal Princess departed and sounded its “Love Boat” harmony-tuned horn, the USC Marching Band then played back the beloved theme song. Royal Princess sails weekly to the Mexican Riviera from Los Angeles (San Pedro) now through April 27, then sails north to Vancouver for a season of Alaska cruises exploring The Great Land before returning to Los Angeles in September where the ship will homeport for six months, continuing cruises to Alaska, the Mexican Riviera and the California coast. Royal Princess is a MedallionClass ship powered by the OceanMedallion, the most advanced wearable device in the global hospitality industry, delivering a hassle-free, personalized vacation that gives guests more time to enjoy what they love most about cruising. Royal Princess first debuted in Southampton in June 2013, and was officially named by Her Royal Highness, Catherine, The Duchess of Cambridge. The original Royal Princess (1984) was christened by Princess Diana. Additional information about Princess Cruises is available through a professional travel advisor, by calling 1-800-PRINCESS (1-800-774-6237), or by visiting the company’s website at princess.com.